Could this season be last chance saloon for Mercurial Frenchman? After a little event over the weekend in Russia that saw France lift the World Cup trophy, we are now heading into day four of celebrations. As the Patrouille de France jets trailed red, white and blue smoke over the Champs-Elysees, one person who may not have been quite so joyous as his countrymen is Anthony Martial. After Didier Deschamps denied him the chance to add a FIFA World Cup winners’ medal to his collection, the 22-year-old has been silent across social media as his country celebrate their second World Cup win. Martial’s exclusion may have come as a shock to some, but to many United fans it was surely no surprise. Whilst many outsiders looking in will be pointing the finger at Jose Mourinho, who is an easy target when dealing out the villain card, the manager is not entirely to blame. Some fans will argue that Martial did not feature enough for the Reds, however the Frenchman still managed 45 appearances, scoring 11 goals and making eight assists for the Reds last season. And with the likes of Kylian Mbappe and Antoine Griezmann making a similar amount of appearances but managing to score over 40 goals combined, there was a lot of competition for a spot on the plane to Russia. 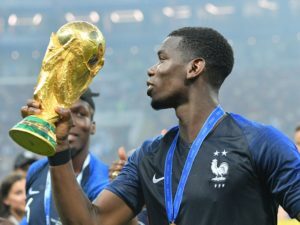 The 22-year-old was probably green with envy watching his teammates lift the World Cup trophy, and will no doubt be dreading the day when Paul Pogba returns to training with his winners’ medal in tow. However, United fans will be hoping that missing out on his national team’s success will be the motivation that he needs in order to improve. Paul Pogba featured heavily in the French team that lifted the trophy after defeating Croatia. Martial kicked off his time at Old Trafford with impressive form. After much scrutiny due to his heavy price tag, the youngster was able to prove his doubters wrong when he scored that third goal in United’s 3-1 win over Liverpool. The Frenchman made an impact in all competitions, playing a vital role in United’s 2-1 victory over Everton in the FA Cup semi-final. The Frenchman not only assisted Marouane Fellaini in making it 1-0 but scored an extra-time winner for the Reds. He also finished that season as the team’s top scorer in all competitions, netting 17 goals in total. With the 2016/17 season came difficulties for the 22-year-old. With United stating the youngster was dealing with some personal issues his form began to dip, something the press couldn’t wait to revel in. Despite starting ahead of other in-form teammates such as Marcus Rashford, Martial paid the price for numerous underwhelming performances and slowly dropped down Mourinho’s pecking order. Since then Martial has failed to cement a position in Mourinho’s starting line-up, and with the arrival of Alexis Sanchez last season he has found first-team football hard to come by. With the summer came demands, as his agent Philippe Lamboley stated that his client wanted to leave the club. However when United players returned to for training, it was a shock to see Martial strolling into Carrington with a grin on his face. As fans rejoiced on social media, the Frenchman seems to have done a 180, and is now allegedly in last-chance talks with the Reds. Could we finally be seeing the 22-year-old mature and realise that with hard work he could still have a place in United’s team? Whilst the youngster’s confidence is probably dented, and some encouragement from his manager may have gone a long way, Martial still has to take some of the blame. After Sanchez’s arrival, Martial’s position was moved to the right, an unfamiliar position which he clearly struggled with. Whilst some fans will empathise with Martial’s difficulties, many could argue that at 22-years-old, the forward should have the ability to be versatile and still deliver a good standard of performances in numerous positions. The Frenchman has allowed other aspects of his life to infiltrate his footballing career, leaving him a shell of the player United first saw, and it is now sink or swim. I would like to see Martial in a United jersey this season, providing he has a new-found desire to improve. Missing out on Russia will have hurt, but I trust that it has been the wake-up call that the youngster needed. It would be a shame to lose such a talented, young footballer who could bring a lot to the team. Only time will tell but I am hopeful that whilst he may not have joined in with Les Bleus and their celebrations, he will be celebrating a comeback with United very soon.